Check out the different packages for this design! 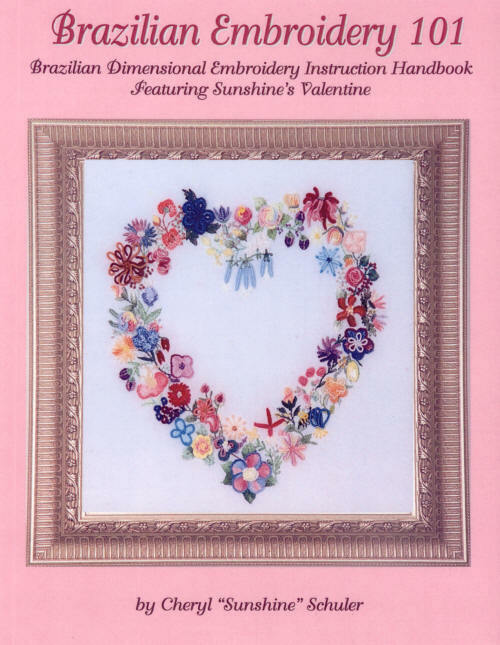 ♥Brazilian Embroidery 101, BK-BE101 with traceable design: Sunshine's Valentine 128 pages spiral bound. Don't have a teacher near by and you want to learn Brazilian Dimensional Embroidery? This is the ultimate instruction handbook for learning the BE techniques. Feel like "Sunshine" is sitting right there and showing you what to do every step of the way. Or if you are a teacher - this is a great teaching tool for your classes. 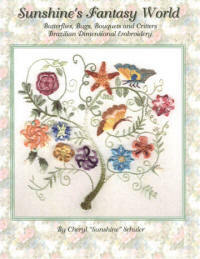 Brazilian Embroidery 101 is a step-by-step manual for learning and teaching Brazilian Embroidery. 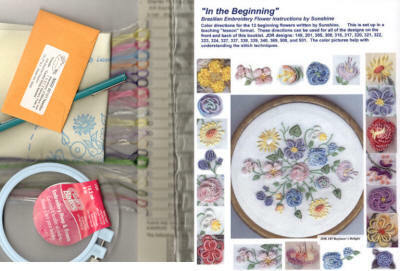 The instruction manual strives to provide the beginner and even the more experienced stitcher with the ultimate step-by-step reference for the most-used beginning, intermediate and advanced Brazilian Embroidery stitch techniques. Included are leaf techniques and ideas. “Helpful hints” have been added along the way to guide you through your stitching. Providing you with over fifty gorgeous flowers and a buzzy bumblebee to help you learn the Brazilian Dimensional Embroidery techniques. Instructions for all of the flowers featured on the cover can be found inside. 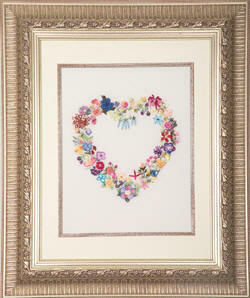 Also included are some buds and filler flowers that you can add to enhance your stitching. The flower instructions are arranged from beginner stitches progressively on to the next step; each flower building on what you learned from the one before. Large graphics have been provided to help those who learn better with pictures. Although the directions are “Brazilian Embroidery” and are written for using “Z” twist rayon threads, other threads can be used for a dimensional masterpiece. The Sunshine’s Valentine, on the cover was developed to provide you with an embroidery design that all stitchers will enjoy completing. The heart has an 8½” X 9” stitching area. The suggested mat opening size: 11” x 17”. The fabric that you need should be about 15” x 20”. ♥JDR 6600 Pattern with directions. You must have the basic knowledge of Brazilian Embroidery. The directions only tell you how to stitch each flower. There is NO stitch technique instructions in these directions. This is for those that have already purchased the book and decided they did not want to trace the design on to fabric. *Special note: buying "print only" means that YOU must have the book. See the choices available to you. Do you need the threads too? Want to see them closer? JDR 6600 TP Full skein thread packet with 69 skeins of thread for the Sunshine's Valentines Heart. It has all the great colors of the design. A special thank you to all the students in the B.E. 101 class. Your questions have made me become more thorough in explaining techniques. You wanted a printable copy – I know this is more than you asked for! The BE students have been my guiding force! If you plan using exactly the same colors you will find that the "Thread packet" above is easier to order than doing it one by one.